Dynamic International are skilled freight forwarders, although our key support to clients often lays in logistics management. We live in a global trading community, where technology, food supply, exploring for resources, or media locations know few barriers. International logistics, the planning and implementation of goods flow, is at the leading edge of business. Success lies in managing information, alongside the movement of goods. Physical movement still matters, across all transport modes but so does being aware. Effective supply chains are built on informational, financial and quality systems. Efficient administration needs state of the art technology, managed by talented staff. We invest in training and mentoring, to bring experience and confidence. 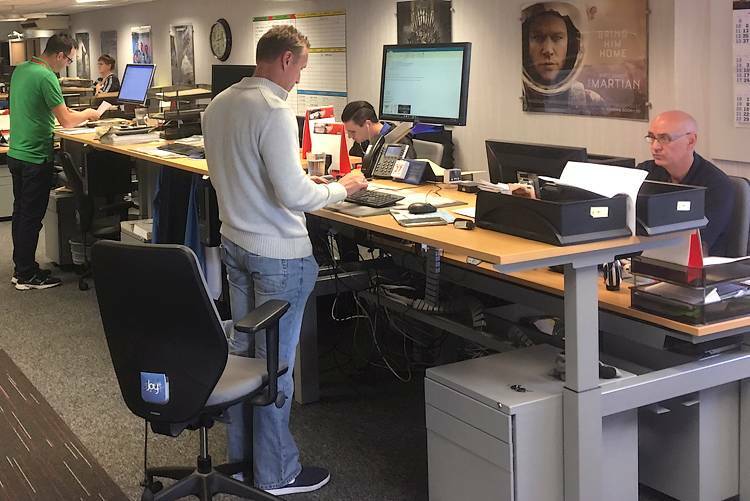 Supporting staff means good facilities, such as the standing desks above if they prefer them, or an office layout which builds information sharing. Teamwork counts and helps to establish the ability for each member to go the extra mile. We encourage staff to help local and national charities, such as our cancer research fundraising. A fine cause and working together on this pulls people together. Through involvement in wider processes, they develop a deep understanding of the technology and infrastructure we use to meet business needs. Giving them the assurance to listen to you, act on your behalf, make good decisions. The energy and interest they find in their role translates to offering clients reduced costs, shorter lead times and safe passage. Through affiliation with IATA and leading UK bodies such as BIFA, or the RHA, Dynamic International support and help create a compliant service for business. We take that a stage further as an AEO approved shipping company. Recognised globally as a safe, secure provider, by customs offices, government authorities and others in the freight industry. Apart from giving our clients peace of mind, this brings priority clearance, less admin and improved information on the flow of goods. Supporting secure supply chains is part of efficiency. With three decades in the international freight industry, Dynamic can meet any requirement by land, sea, or air. Through our own resources and a network of trusted global partners. From a small package needing an urgent flight, to transporting heavy lift, or out of gauge cargo, we provide creative, effective solutions. Always built to match your schedule and standards. They come from experience and above all, our committed staff. Talk to them at any time, or return to our introduction on a freight and logistics service able to support capital projects, or your unique requirement.